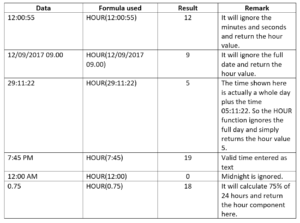 What is the HOUR Function? The HOUR function is categorized under DATE/TIME functionsFunctionsList of the most important Excel functions for financial analysts. This cheat sheet covers 100s of functions that are critical to know as an Excel analyst. The function returns the hour component of a time as a number between 0-23. For example, it will return 13 for 1:49 PM. Serial_number (required argument) – The time that contains the hour we want to find. It will return the hour of the time value. The hour given will be an integer between 0 to 23 where 0 represents 12:00 AM and 23 represents 11:00 PM. 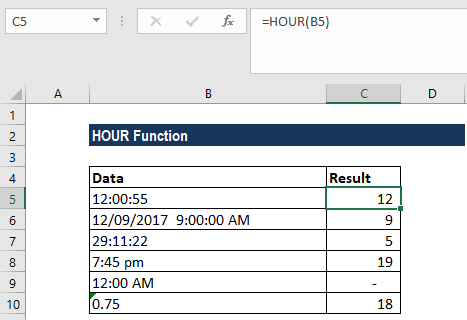 How to use the HOUR Function in Excel? In case we get an error, we need to remember that Excel stores dates and times as serial numbers. For example, the date January 1, 2000, 12:00 PM is equal to the serial number 32526.5 in Excel. To check that Excel correctly recognizes a date or time, we can temporarily format the date as a number. #VALUE! error – Occurs when the given serial_number is not a valid Excel time.